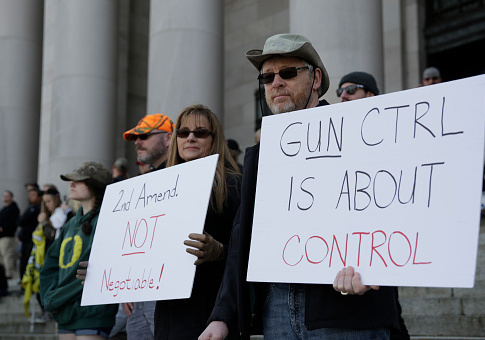 The National Rifle Association and Second Amendment Foundation filed suit against Washington State's new gun-control law on Thursday. The suit represents the latest step in the gun-rights groups' fight against the collection of new gun regulations imposed by ballot initiative 1639 which passed during the midterm elections. Prior to the election the groups sued over the way advocates constructed the petitions they used to gather signatures. A state judge initially disqualified the initiative from the ballot but the state supreme court later reversed the ruling and allowed it to move forward. The gun-rights groups have now joined with local gun dealers and young adults affected by the new law in filing the new case in the U.S. District Court for the Western District of Washington. The plaintiffs claim the wide-ranging new law violates the 1st, 2nd, and 14th Amendments as well as the commerce clause and the Washington State constitution. Initiative 1639 successfully outlawed the sale of semiautomatic rifles to adults under the age of 21, instituted a requirement that those who wish to purchase a handgun sign a waiver allowing police to search their private medical records, mandated a 10-day waiting period for all semiautomatic rifle purchases, and instituted a number of additional gun-control measures. The NRA said the law infringes on its member's constitutional rights. "The NRA is committed to restoring the Second Amendment rights of every law-abiding Washingtonian," Chris W. Cox, executive director of NRA's Institute for Legislative Action, said in a statement. "I-1639 violates the constitutional rights of law-abiding citizens and puts people at risk. This lawsuit is the first step in the fight to ensure that Washingtonians are free to exercise their fundamental right to self-defense." The SAF said the new suit was just one of several legal actions they were pursuing. "We are also considering additional legal challenges," said Alan Gottlieb, SAF executive vice president. "We are disappointed that too many Evergreen State voters were fooled into supporting this 30-page gun control scheme, despite overwhelming law enforcement opposition. This initiative is an affront to the constitutional rights enshrined in the Second Amendment and the Washington State constitution, especially for young adults." Gottlieb said rights enshrined in the Constitution can't be removed by a majority vote. "We're determined to fight this egregious measure because constitutionally protected rights should never be subject to a popularity vote," he said. "The wealthy elitists behind I-1639 want to turn a right into a regulated privilege. This measure was only designed to have a chilling effect on the exercise of a constitutional right by honest citizens while having no impact at all on criminals, and we cannot let it go unchallenged." The gun rights groups said they were committed to a long-term fight against the new gun law if necessary. "The NRA will fight to overturn this unconstitutional initiative," he said. "We will not sit idly by while elitist antigun activists attempt to deny everyday Americans their fundamental right to self-defense." This entry was posted in Issues and tagged New Gun Laws, NRA. Bookmark the permalink.